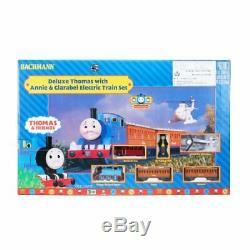 Bachmann 00644 HO Scale Deluxe Thomas and Friends Special Ready-to-Run Train Set. Thomas the tank Engine TM and his coaches Annie and clarabel have started on a magical journey across the Island of Sodor. Back at the station, Sir Top ham Hatt sends Harold the helicopter and Bertie the bus to keep an eye on Thomas to make sure he arrives on time. With our deluxe Thomas & friends tm special set, you can relive the stories seen in the Thomas & books, television shows, videos and feature film, or create your own railway adventures. 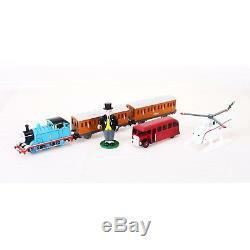 This ready-to-run train set includes: Thomas the tank with moving eyes Annie coach with international style hook-and-loop couplers clarabel coach with international style hook-and-loop couplers Bertie the bus Harold the helicopter Sir Top ham Hatt figure 56" x 38" oval of snap-fit E-Z track with 12 pieces of curved track, 3 pieces of straight track, and 1 straight plug-in terminal rerailer power pack and speed controller illustrated instruction manual warning: CHOKING HAZARD - small parts! Not intended for children under 3. Thomas the Tank Engine and his coaches Annie and Clarabel have started on a magical journey across the Island of Sodor. Back at the station, Sir Topham Hatt sends Harold the Helicopter and Bertie the Bus to keep an eye on Thomas to make sure he arrives on time. With our Deluxe Thomas and Friends Special set, you can relive the stories seen in the Thomas and Friends books, television shows, videos and feature films, or create your own railway adventures. Let me know how many you want and I'll send an offer. If the picture doesn't match the title, then go with the title. If the Road number of a train does not match the title, then go with the title. If your completely unsure then contact me. Please don't assume anything. If you are the slightest bit unsure please research it or contact me. DO NOT OPEN THE ITEM! If you open it I can't take it back since I won't be able to resell it. Customer ordered the Wrong product or just don't want it. Items must be in "new, unaltered and unused condition". Must be in original box unopened with no damage to the package or packaging including cellophane wrapping (we need to be able to resell that product as new). DO NOT OPEN THE ITEM IF YOU ARE GOING TO RETURN IT! That is 20% of the items price you paid. Wrong item sent or defective product. If we make a mistake by sending you the wrong item or you get a defective product we will make it right at no cost to you. 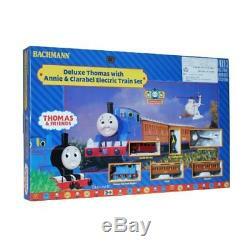 The item "Bachmann 00644 HO Scale Deluxe Thomas and Friends Special Ready-to-Run Train Set" is in sale since Monday, October 8, 2018. This item is in the category "Toys & Hobbies\Model Railroads & Trains\HO Scale\Starter Sets & Packs".